Interestingly, the tree holders of wood, weighted down with lead, were decorated with a garden with house and figures, "animals of clay for its garden, and drying them by the kitchen stove. They were in the true quaint style of those sold by the country people. Two stags of chocolate colour, with gilded horns; a funny sheep; two birds representing, however ill, storks—one silvered over; a dog, and two shepherds with their tall staves, and arrayed in purple and blue, with green hats. All these were half lost in a wilderness of moss and heath, or issuing out of a wood formed of the twigs of the fir-tree." 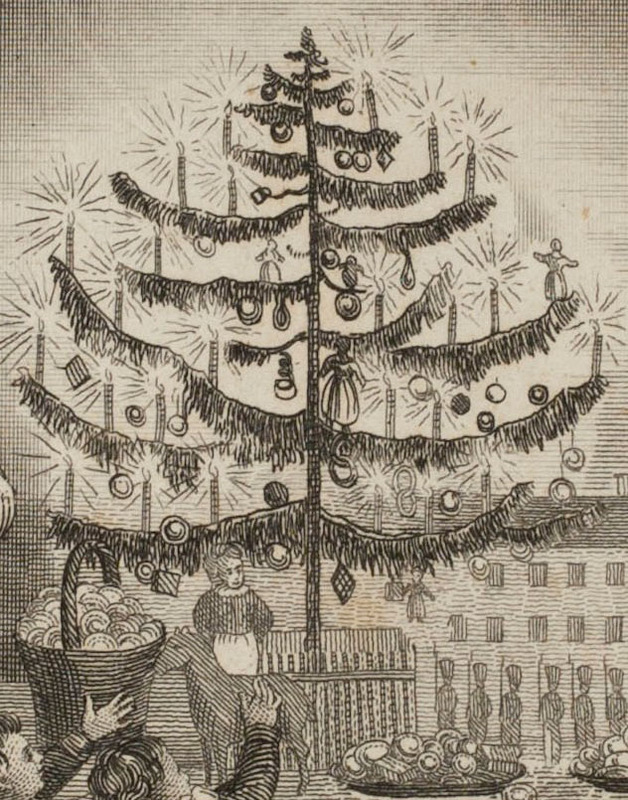 The trees themselves were lavishly decorated with small red candles, sugar confections - fruits, musical instruments (trumpets, guitars, harps) "coloured hearts crowned with gilded crosses, dames in different costumes, babies on swaddling-boards, children riding on dogs." Trees were sold at the market, or cut from the woods - some were cut from the tops of trees, "the woodwatchers are particularly on the alert, and a heavy fine is inflicted on any offenders that are taken in the act." Or "boughs straight enough to resemble tops"
"The day arrives. The drawing-room, or in Germany, the saloon, is closed. Only the person who is entrusted with each one's secret is admitted to it, and has the key. All the young people of the family, in fact, have been previously busy in preparing the tree, gilding walnuts and apples, and hanging them upon it; hanging on it also sundry little cakes, and figures of sugar-work of various colours. This has been the source of great delight to them. 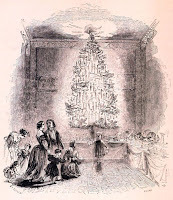 The tree has been set in its place, and then the room consigned to the one confidential person, who has laid out, in tasteful array, the presents intended for every person, each in a group by themselves." "But, perhaps, the confectioners shops are in the greatest glory, the Germans being as great lovers of sweetmeats as of tobacco. Here are to be seen immense quantities of all sorts of little cakes and confections; almost every thing that you can conceive in sugar and chocolate. Figures in the costumes of all nations; grotesque-figures; figures of animals, and of all kinds of characters. The student smoking, the bauer or peasant, the countrywoman, the child on his rocking-horse, Swiss and Tyrolese maidens, all elegantly moulded and gaily coloured, with representations of sausages, fruits, musical instruments, thimbles, etc. These are chiefly bought to hang upon the Christmas-tree. They are set out in the shops in separate departments, each after their own kind; and, on entering, so well does the sugar-baker know what you are come for, that he hands you a basket, and you go round and select such figures as you please. For about a fortnight before Christmas the markets are filled with preparations… Numbers of Christmas-trees shew themselves for sale. These are principally tops of fir trees, or boughs straight enough to resemble tops. Much damage is said to be done in the woods at this season, by the cutting of these tops; the woodwatchers are particularly on the alert, and a heavy fine is inflicted on any offenders that are taken in the act. These trees are from six inches high up to ten or twelve feet or more, according to the size of the house, or the finances of the purchaser. 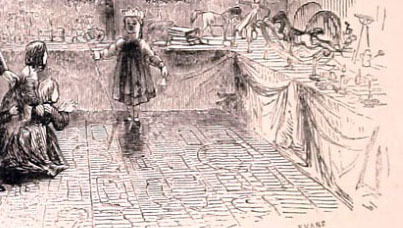 They are generally set in a thick board or block of wood, weighted with lead, and on this board is made a garden, paled in with ornamental paling, having at the back generally a house of wood or cardboard. The garden is filled with moss and green sprigs of the fir, and in it stand shepherds, sheep, a dog, a stork, and one or more stags with gilded horns. This is intended to represent the annunciation of the birth of Christ to the shepherds; and, accordingly, an angel is seen, suspended by a wire from the stem of the tree, as in the act of hovering in the air and proclaiming the glad tidings. The shepherds and animals are made of clay, most grotesque creatures, painted in barbarous style; the storks adorned with feathers for tails stuck into the clay; and all are propped on little pegs of wood. Christmas-trees are seen moving off in various directions, with their gardens appended, or others without gardens, the families which have purchased these having retained their garden of former years on its block of wood. The day of Christmas-eve itself, the floors of the shops are literally piled with the baskets of country people, which they have set down while they make their little purchases for their children. The important eve itself arrives. Throughout Germany, in every house, from the palace to the cottage, where there are children, there stands a Christmas-tree." The Christmas-tree was truly superb. It was, as the best trees generally are, a young spruce fir, possessing a fine dark green, a distinctness of branches, and a graceful tapering figure. It had been got out of the woods and fixed into its frame by a neighbouring peasant, who entered into its preparation with the spirit of a child, and had been for weeks before manufacturing animals of clay for its garden, and drying them by the kitchen stove. They were in the true quaint style of those sold by the country people. Two stags of chocolate colour, with gilded horns; a funny sheep; two birds representing, however ill, storks—one silvered over; a dog, and two shepherds with their tall staves, and arrayed in purple and blue, with green hats. All these were half lost in a wilderness of moss and heath, or issuing out of a wood formed of the twigs of the fir-tree. On the pales of this enclosure were stuck gilded almonds and nuts; and on the tree itself, a rich crop of very various fruits. Gold and silver walnuts depended from the boughs; silver apples; cakes of different colours and forms, like so many strange but beautiful flowers; coloured confections and fruits; and musical instruments, as trumpets, guitars, harps; coloured hearts crowned with gilded crosses, and other devices. Many human and other figures shewed themselves amongst the foliage; dames in different costumes, babies on swaddling-boards, children riding on dogs, etc. An angel with golden wings and crown fluttered from the end of a bough; a student sate smoking on the side of the stem; and various little red tapers [candles], attached to the ends of different branches, glowed like so many starry flowers, and completed the beauty of the whole. As for presents to and from every one, they covered the whole two ranges of tables; the room was like a bazaar. One was quite surprised at the number of things as they lay all in one display. ... in a crescent form, went the tables, and then stretched down each side of the room, draped, as I have said, and covered with the various presents. Along the fronts of the tables burned no less than seventy small wax-lights, rising out of a border of green moss. [One child, a] stout little fellow of three years set out his gifts of kitchen utensils in the middle of the floor, and sitting down amongst them, forget all about him in arranging and re-arranging them, pretending to cook and make coffee in true childish style, till the wonders of the magic-lantern called him away, and then to go off to bed, happier than any prince, with a load of toys under each arm, to stand by his bed and greet him on waking."